Review of George Kosch’s interactive home business and affiliate marketing training session Sept 15, 2017. Next LIVE training session is Friday Sep 22nd, 2017 at 8 AM CT / 9 AM ET. Hope to see you then. Review of LIVE Home Business Bootcamp Training with George Kosch Friday July 8, 2016. How to earn money using Worldprofit’s system. Worldprofit’s 22nd Birthday celebrations. Watch for special offers in your email! We’ve developed over many years a unique comprehensive training program and proven system to help our Members build their own successful business. Topics covered in the April 15th training session with Worldprofit Co-Founder and marketing expert, George Kosch. Your Ad Tracker – how to use and why this is so vital to evaluating your promotion. Online Bootcamp Lessons – Importance of first 3 lessons. Master the basics of promotion so you can use these skills to build ANY and ALL your online businsesses. Need help along the way? Just submit a Support Ticket, we are here 7 days a week to help you. There are over 125 lessons you can do at your own pace to learn about all aspects of online marketing, as well as how to use and benefit from the services and resources included in your membership. Associates: the lifebood of your business. How to generate Associates, why you want to. The "Money" Seat. When you become a Monitor you take over the MONEY SEAT. -How to become a Monitor to score some nice perks and gain a unique learning opportunity who won’t find anywhere else. -Once you upgrade from JR to SR Monitor you can see the schedule and pick your hours. -Thank you to our Monitors who volunteer their time to help make sales for our community Members in our LIVE Business Center. -Ad Tracker. Access on TOP MENU select AD TRACKER. This included tool is VITAL to assessing the effectiveness of your advertising. -The GemStone Advertising Packages (Diamond, Gold, Sapphire, Ruby). Optional. -Cool Tools section of your member area, (Top Menu) helpful recommended optional products to streamline your business activitiies. -WorldprofitTube.com – access free recorded bootcamp videos and search by topic or keyword. -Sales Funnel Builder ( 9 ready to go, LEFT MENU select Money Makers). Included. -Prospect Emailer (Custom letters) Included in your Silver or Platinum VIP Membership. Saves you time by not having to keep typing up your ad copy, ad titles and URLS when you are promoting. Access this tool under COOL TOOLS linked on TOP Menu. There is a minimal cost for this tool. – Commissions are paid out on the 15th of the Month. That means TODAY is PAY DAY for many of you! – How one sale can earn to many more sales, more and more commission over time. There is a Monitor Meeting on Saturday April 16th at 8 AM CT / 9 AM ET. All JR and SR Monitors encouraged to attend. A link is sent out on Saturday Morning to access the meeting and it is also posted in the Monitor section of your member area. Next LIVE home business bootcamp training with George Kosch is Friday April 22nd, 2016. 8 AM CT/ 9 AM ET. Worldprofit Bootcamp Update: I hope to see you there? You want to earn online, eh? You want to get off to the best possible start, right? You want to increase the number of sales you are making, of course you do! So you won’t want to miss the training on Friday morning. This training is for YOU! I’m George Kosch, and I am your Bootcamp Instructor, Your Personal Coach, Your Sponsor. I am your GO-TO guy for everything related to making money online. I teach you how to make sales! I teach you how to make MORE sales! I teach you about leads, about traffic, about strategies proven over and over again to really work! Invest in yourself. It’s your time. George is available to you every week to answer your questions, provide demonstrations and teach you what you need to do to earn consistent online income. 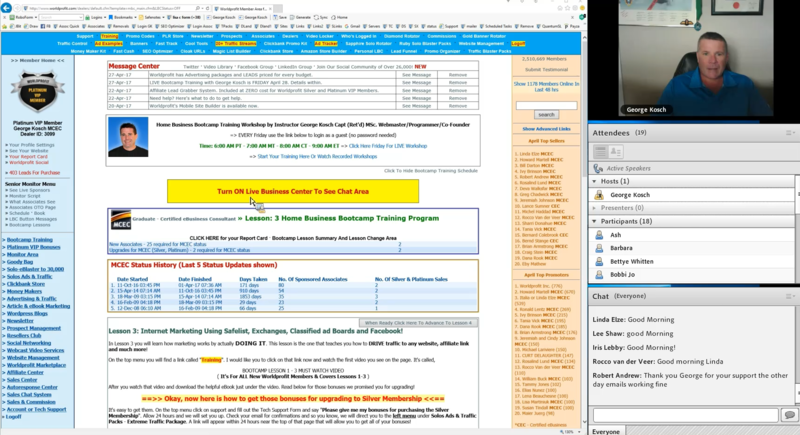 On training day, a few minutes before 8 am CT login to your member area and click on the live workshop link under Bootcamp Training on the left menu.